1. X-linked hypophosphatemic rickets is caused by abnormal reabsorption of phosphate in the proximal renal tubule, resulting in excessive excretion of phosphate and hence hypophosphatemia. 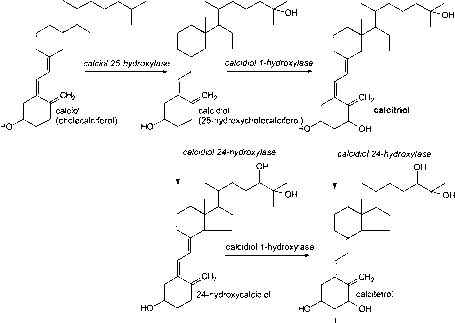 There may also be blunting of the normal increase in calcidiol 1-hydroxylase activity in response to hypophosphatemia. The gene responsible for the condition has been identified (the PHEX gene); its product is a membrane-bound endopeptidase that normally acts to clear the hormone phosphatonin from the circulation. Phosphatonin acts to decrease the activity of the sodium/phosphate cotransporter in the kidney (Drezner, 2000). 2. Tumor-induced osteomalacia (oncogenic hypophosphatemic osteomalacia) is also characterized by excessive urinary excretion of phosphate, and hence hypophosphatemia and low circulating calcitriol. Removal of the tumor results in normalization of phosphate excretion and recovery from osteomalacia. The tumors that cause osteomalacia secrete abnormally large amounts of phosphatonin (Kumar, 2000). 3. Type I vitamin D-resistant rickets is due to a genetic defect in calcidiol 1-hydroxylase, so that little or no calcitriol is formed. Patients respond well to the administration of 1a-hydroxycholecalciferol, which is a substrate for 25-hydroxylation in the liver, leading to normal circulating concentrations of calcitriol. (a) Complete absence of calcitriol receptor, presumably the result of a deletion or early nonsense mutation in the receptor gene. (b) Poor affinity of the receptor for calcitriol, presumably the result of a mutation affecting the calcitriol binding site. (c) Normal receptor binding of calcitriol with impaired responsiveness of target tissues, presumably the result of a mutation affecting the DNA binding domain of the receptor.